With summer winding down, I’ve had time to think about some of the kid-focused teaching ministries we’ve had in my area. I guess it’s because as my kids get to that Age I wind up becoming more aware of the teaching they receive resulting in an area of concern for me. Or maybe there’s a curmudgeon to age ratio that I’m evidencing in my interactions: who knows. Anyway, when I think about teaching and my kids—and other people’s kids—Bart Ehrman comes to mind. Give me a sec to explain. Here’s a guy who professed Christianity, went to Moody, was trained as a textual critic and eventually threw away his faith because he said he found an error in the Bible. Apparently, this guy either had a faulty view of inerrancy or he placed inerrancy in a weird position in his hierarchy of beliefs. Don’t get me wrong, I firmly believe in inerrancy (it’s one of my pet subjects) but I think one should hold to inerrancy because there is a strong biblical and theological groundwork—not because one needs it to be a Christian. In other words, instead of holding to inerrancy because of his belief in God, Ehrman believed in God because inerrancy was true. When his view of inerrancy collapsed, it took his faith with it. So much so, he got vocal with his agnostic atheism. Enter my concern with (my/our) kids: Adults constantly underestimate them. Kids are capable of understanding a vast amount of things, and appropriating them in their system of beliefs—without all the inhibitions that prevent Adults from accepting things. I don’t mean that Kids are stupid and can fall for anything. No, it’s more like they are tapped into a world that is constantly expanding so they don’t have a problem allowing consideration of some idea or another even if the ideas are paradoxical. 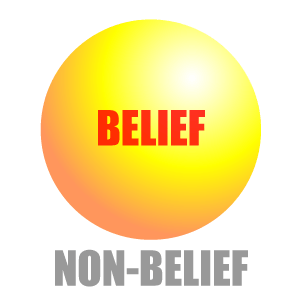 Call this expanding world of The Believed a Belief Sphere. Adults on the other hand have reached a point where they’ve habitually categorized things. With those presuppositions undergirding their mind, we Adults often refuse to consider after we’ve concluded—or worst, taught. We’ve committed to an Idea and anything outside of what we have defined as World, ceases to exist: or at the very least grows dim. So although we have a Belief Sphere, our Conclusion Sphere holds priority. So Adults underestimate that a kid can appropriate very difficult concepts (by putting them in their Belief Sphere with an invisible subhead of needs-working-out). By underestimating them—and thinking in Adult Categories—the Adult often hands over the post-masticated theological Conclusion Sphere without any of the structure or grid-work that gives real foundation to that conclusion. 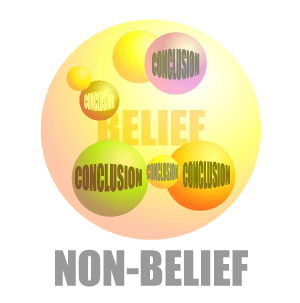 It’s an idea void of reason for belief—the undergirding just winds up being merely consequences for not holding to this Conclusion Sphere. 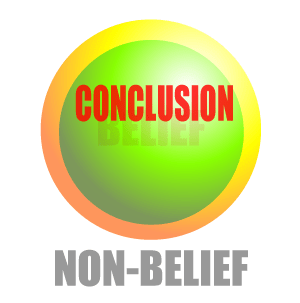 Everything outside of that Conclusion Sphere winds up labeled Non-Belief instead of Non-Conclusion. As an example: instead of entrusting the child with the strong theological grid-work of the Creator God and his Derivative Creation (Belief Sphere), we hand over our Conclusion Sphere which consists of my view Creation Week. The Consequence of not holding to my Conclusion Sphere, we warn the Child, is that that belongs outside of Belief—it is the Outer Darkness of the Non-Believing Realm. Enter the day that the Child becomes an Adult and casts away our Conclusion Sphere but thinks it’s labeled Belief Sphere. Since he’s not embracing Belief, he’s embracing the Other category: Non-Belief. Mind you, I’m not saying we don’t teach our view of Creation Week. Or even the importance of Inerrancy. I’m saying that all these teachings should be handed over with a strong theological grid-work established on Biblical grounds—as a Belief Sphere—so that when (not if) our Conclusion Sphere is at some later point challenged, the Child-then-Adult still finds himself with the strong undergirding of the Belief Sphere. The single Conclusion has no problem collapsing since it was part of a larger matrix. I’ve mentioned before that I learned some fairly odd things pretty young in my faith and the thing that brought me back was the historicity of the death and resurrection of Christ. I realized the importance of the centrality of the death and resurrection. It was so important that if it ever comes about that I find out that Jesus really drank grape juice instead of wine, my faith wouldn’t be shaken. Anyway, this is just a really long-winded way of me saying I have concerns with how and what we teach kids. This summer, I was given opportunity, via the grace of God, to help in some endeavors and answer questions where they needed clarifying, and re-teaching where something was being occluded. So I’ll touch on a VBS program that I’ve reformulated—maybe even touch on last year’s VBS too, I don’t know—and some questions that came up during the summer that may be helpful for other parents as they deal with their kids, just for the sake of e-posterity and Google-searches. If there were a take home in this it is this: don’t underestimate your kids. Unleash the Gospel in its entirety. They can handle it. Sure, you could (and should) be afraid of Conclusion Spheres that you reject; that’s perfectly understandable—ideas have consequences. But don’t fear giving your kids the reason for the hope and faith (the Belief Sphere) that is within you. Too often we think that that applies only to the Stranger Outside The Home when our kids are the ones who are actually the most likely ones to ask us “Why?” Knowing that our Belief Sphere is really faith in a crucified creator God who gave himself for us, then rose again and promises to save those who trust in Him should allow us to be very open with supplying them with those foundational answers. After all, trusting Him is what saves—not trusting in some concluding interpretation.